We join our Tour Leader and fellow walkers on Friday evening for a welcome drink and dinner at the hotel before striding out on first walk on Saturday. 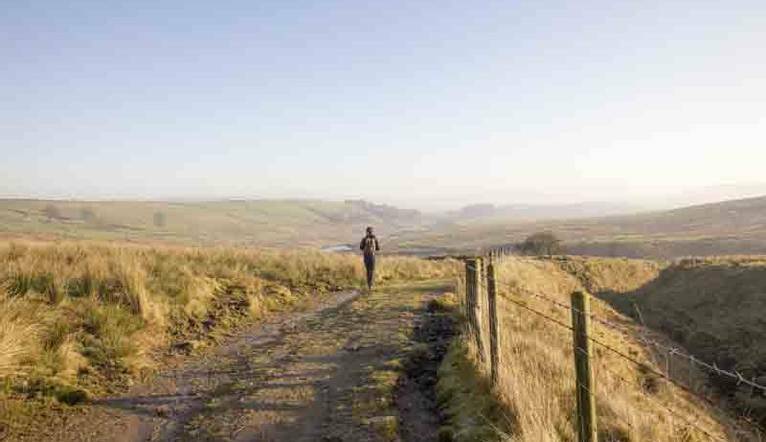 On Saturday we head over to The Forest of Bowland which is an Area of Outstanding Natural Beauty. Renowned for its grandeur and isolation of moorland hills to the undulating lowlands with their settlements, woodland cloughs and river valleys. Our walk takes us from the small hamlet of Dunsop Bridge (the official centre of The British Isles according to the Ordnance Survey) through farmland and over moorland for a lunch stop in the picturesque village of Slaidburn on the banks of the river Hodder. In the afternoon our walk continues along the shores of Stocks Reservoir to end at The Forest Centre of Gisburn Forest a haven for mountain bikers. Our half day circular walk is on the slopes of Winter Hill a well known landmark for those travelling along the M6 motorway to the North of Bolton. The highest point in the West Pennines, Winter Hill overlooks the village of Rivington. The early stages of the walk are within the estate once owned by Lord Leverhulme where we leave the terraced gardens and head higher on to the open moorland to Rivington Pike with its impressive views before returning to our start point. The hotel can be found just off Junction 1 of the M55 for the A6. Preston Station is the nearest station just under 4 miles away. Complimentary car parking is available. Facilities at the sophisticated hotel include a restaurant, coffee house, lounge bar, indoor swimming pool, sauna, gym and spa (extra charges apply). Many of the guest rooms have picturesque views and all feature air-conditioning, satellite TV, safe, ironing facilities and Wi-Fi (chargeable).